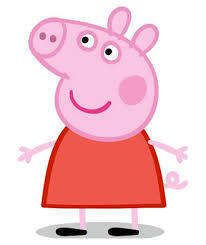 10 Signs Your Child May Be Watching Too Much Peppa Pig! The Boy has been in a Peppa Pig phase for a while, and I have to say, it’s a pretty good show, as far as kids shows go. I have actually found myself laughing on many occasions at the crazy hi-jinx of Peppa & her zany family, rather than wanting to stab out my own eyes, the way I do when I have to suffer through an episode of Olivia or Max & Ruby. At least this pig lives with her parents. However, I do think The Boy might have watched just one too many episodes of Peppa this summer, and may be on the verge of a Peppa Overload! Yes, silly, of course I used all of this Peppa mania as a teachable moment … We had a long talk about the different expressions & pronunciations that the British and the Americans use, although I do think he may be an Anglophile in the making.